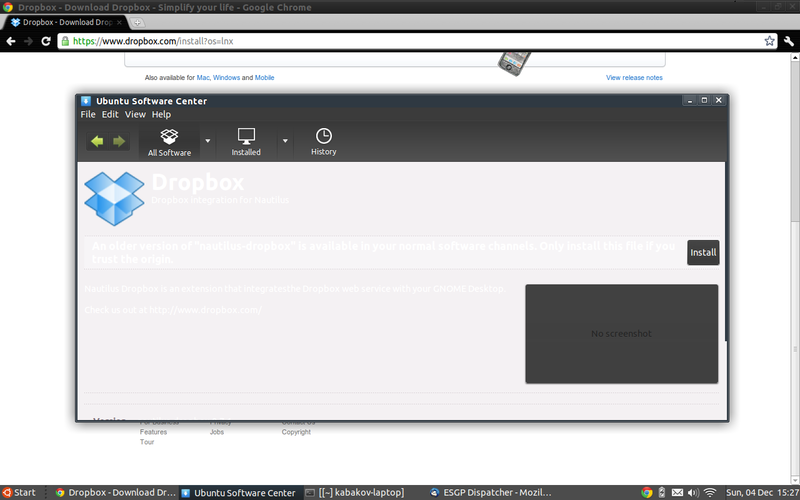 * A user is unable to view the text within the software center application which makes the application almost unusable. * Ubuntu GNOME users that are currently using a dark theme with an LTS release requested that the fix be backported to trusty from wily. * This fix applies a custom style sheet for the dark variant of Ubuntu GNOME Adwaita theme. * You will find that text is translucent which is hard to read on the home page. * Click on any package. The package text is the same color as the background. * Open software center and all text is now legible. * None. This fix was applied in Wily. * Fix for trusty was tested with both dark and light themes for both Ubuntu Gnome and Ubuntu Unity. I've been poking about, but there are a lot of files associated with the software center, so if one of you could tell me which of those to edit, I'll happy do it manually for now. I tried editing /usr/share/software-center/ui/gtk3/css/softwarecenter.css, but a;as, while I could change some colors there (specifically, the ones on the first screen), still couldn't change the colors for font or background for the application information screen. I can't believe that this bug started in Oneiric(maybe even before that) and it's still not fixed after Raring (as per https://bugs.launchpad.net/ubuntu/+source/software-center/+bug/913933 ). 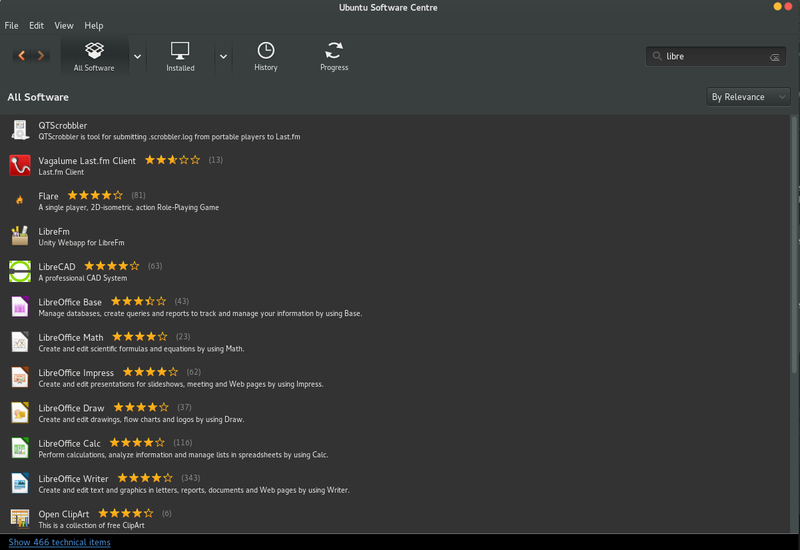 Ubuntu Software Center is a core feature of Ubuntu distribution and yet such a bug which affects its usability is left unnoticed! Why can't it just follow the system theme instead of using hardcoded colors. Some Dark Theme developers have found workarounds involving replacing the softwarecenter.css with custom versions. One such fix by Delorean Dark theme developer is attached here. It is optimised for Dark Themes and works fine with light ones too. I don't know if it works perfectly with light themes,but it does try to use current theme colors instead of hardcoded ones,atleast in some places. The attachment "Delorean Dark's Software Center fix for Dark Themes" seems to be a patch. If it isn't, please remove the "patch" flag from the attachment, remove the "patch" tag, and if you are a member of the ~ubuntu-reviewers, unsubscribe the team. A. Replace USC's normal CSS file with killhellokitty's CSS file, to see if it works in both of the standard Ubuntu themes. B. If it does work, produce a diff of one file against the other so we can see exactly what is changed. I tried both default themes Radiance and Ambience in Ubuntu 12.04 to check if they work well with killhellokitty's CSS file. Everything seems to be okay, except for selected items' text color in list view. Both background and foreground are light colors. this is because the CSS file was designed for dark themes. ideally software center should show dark text with light background and light text on dark themes. killhellokitty's css theme is better than the default one, but needs a little more work to be the ideal theme. Hi, I'm currently developing/designing a Gtk theme which sets a white background for GtkTreeView:selected. In the softwarecenter.css file, the background is hard coded to be selection_bg_color, meaning that the red (which is the selection bg color defined in my theme) text is invisible on the red selection background, as shown in the screenshot. Would it not be more reasonable to let the themer set the value for this? Auroral, what happens if that CSS rule is removed? Is the selected row still an appropriate color? If so, perhaps you could attach a patch that removes it. Thanks! To all you people who want a temporary fix.. This is what I did (look inside the file and first 2 lines..) I changed the colors of the background that way. It /kindof/ fixes it.. but at least you can read most things.. just not when the windows is off focus. A better solution would be to separate the CSS from the USC altogether and let themes dictate what the software centre looks like as the hardcoded nature of the CSS means other problems arise for theme developers. If you make an application with hardcoded BG color, your text over that background SHOULD use hardcoded font color. App content should use just theme colors or should use just hardcoded colors... not both. You can't mix things up. That practice is not functional and result in a half-assed application. The mix is the problem. If it was simply changes to the general case and those exact CSS classes we added to Ambiance/Radiance the issue would be solved & it would solve problems with several other themes.. Further hardcoding of the CSS worse. And, HARDCODE is never an option. Also affects freshly installed 15.04 release candidate as of 26th of January. Also present in Gnome 14.10 with staging ppa. Why is this still not fixed? it seems like it wouldn't be that hard, and it has been years since it was first reported. Does anybody here understand how we can/whether it's possible to get the theme colours into CSS? Sort of like "gtk:bg[NORMAL]" in the XML metacity themes. This page may be useful, but I don't fully understand it. Commenting out GtkViewport, GtkTreeView and GtkTreeView:selected in the aforementioned softwarecentre.css seem to make the necessary changes: http://i.imgur.com/KwvaEdl.png but the front page still looks terrible thanks to the hardcoded background: http://i.imgur.com/Z1J9K42.png. Still looking to see where the background (stipple.png) is called from. Interestingly in the css folder that contains softwarecentre.css there's also some css files labelled 'high contrast' and 'high contrast inverse' - it would be nice if we could find out how the software centre decides when to use these; then we could create a 'dark theme' one. More than 4 years with this bug not being fixed, this is why i use synaptic. Guys. If you posted a small bounty on https://www.bountysource.com/ you might get a quick resolution to this bug. When the bug doesn't effect the default path that is kinda how free software works if you don't have the personal ability to fix the bug. I've started working on a patch for this two weeks ago and I'm hoping that I can get this finished by next week. Currently I have a problem getting the fake ratings API to work under Ubuntu Gnome, but I have a work around in mind. This is a separate style sheet that will only load if Adwaita is the GTK theme currently being used based off the Ubuntu Gnome palette. Before officially linking the branch to this bug report I would like to run it through the Ubuntu Gnome Artwork team to see if they would like to tweak any colors. Screen shots attached. Feedback is welcome. keying a fix for this general problem to a specific theme seems like the wrong solution. The proper fix is to just honor the theme's foreground/background colors, whether it is Adwaita or some thing different. I think the images look great. Bruce's is not a fix for this bug. It's a workaround, because the bug is at "Software center" application. Jakey_TheSnake: "but the front page still looks terrible thanks to the hardcoded background: http://i.imgur.com/Z1J9K42.png"
So anyone fluent with Gimp could fix that part, even if you aren't a coder: edit or redraw <http://bazaar.launchpad.net/~ubuntuone-control-tower/software-center/trunk/view/head:/data/ui/gtk3/art/stipple.png> ("download file") so that it is stipple on a transparent background, rather than stipple on a hard-coded grey background. Once we've done that, the colors won't need to be hard-coded for the sake of the stipple background, so maybe removing those CSS rules is enough to fix the bug. Here is the transparent stipple.png. Let me know if you need any other images. Alerted the Ubuntu One Control Tower of the image revision with a link to this bug for review and consideration, and possible usage. Thanks Matthew. 5. Transparent with custom Adwaita CSS and 90% transparency drawn by Cairo (line 178 of catview.py). Default is 50%. When testing the transparent stipple with Adwaita, the text becomes more illegible. USC has support to load custom css based off the gtk-theme-name, which you can see in line 55 of utils.py. You can easily test the loading of the theme by opening USC and then changing it to something like highcontrast which has its on css file and this will change in real time. So if you use Numix you can provide a softwarecenter.numix.css. From what I can see for a workaround to use GTK theme colors, simply move softwarecenter.css out the way (softwarecenter.css.bak). The code currently looks for a softwarecenter.<theme-name>.css if that does not exist, it loads up the softwarecenter.css. If that does not exist as well it uses the styling from the GTK theme. Alternatively whip up your own CSS file for your favourite theme, or ask the author to create one for USC if you want USC to match the theme. I hope that helps a bits. I understand that this approach is for Adwaita, but no one has provided the theme name they use when they filed or commented on this bug report. So my next question is, what theme(s) are you using? Oh, here is the stipple recreated in GIMP if anybody wants to play around with it. Omadas, I totally missed your comment and attachment! Every once in a while I forget why I don't use Ubuntu Software Center... but then I start it and remember why... I can't read anything (white font on white background). This has been a weird situation because I run a lot of apps and NONE have this problem with the current theme that I use. I decided to look up the bug this time... and what a long history there is for this bug! I don't know how apps like this get included with a mainstream ubuntu. It appears that a couple months you were close to a fix, but then... the progress has seem to have stalled. It makes me think that USC really isn't supported. If a "minor" bug like this can't be fixed, then how should I feel about the quality of the Ubuntu Software Center as a whole? Add a style class for the action bar, so that we can give it some theming. How is the process/time to be this released fix available for normal updates? This was only fixed for Wily (15.10). I don't think this fix will be backported to trusty or vivid unfortunately. Really unfortunate if fix is not backported to Ubuntu Trusty (14.04 LTS). Since Ubuntu 15.10"Wily"'s getting EOL'd in 9 months and Software Center's gonna be dropped from Ubuntu 16.04LTS, I think the most relevant place for this fix is Ubuntu 14.04LTS "Trusty Tahr". Like @narcisgarcia pointed out, Software Center on 14.04LTS shouldn't be left unfixed for 5 years until 2019! 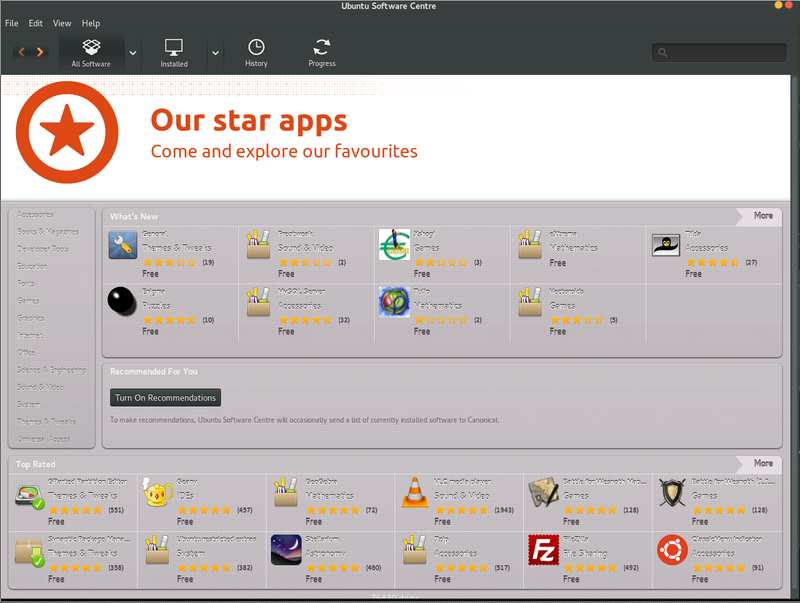 Besides, there wasn't any major version change between trusty and wily versions of Software Center, as you can see from https://launchpad.net/ubuntu/+source/software-center . So, a backport's feasible. How about we request to backport this fix through an SRU (https://wiki.ubuntu.com/StableReleaseUpdates) for Ubuntu 14.04LTS? Narcis and HEXcube, I'll see what I can do. I don't have a time frame as yet but I'll keep you updated on the progress. @octoquad , I downloaded the modified files from your branch http://bazaar.launchpad.net/~octoquad/software-center/899878-hardcoded-colors-dark-theme/revision/3326 and used them to directly replace the corresponding files in `/usr/share/software-center/*` . I wouldn't normally replace files like this, but Ubuntu 14.04LTS and 15.10 use the same version of Software Center except for some patches (See https://launchpad.net/ubuntu/+source/software-center ). Then for testing dark theme, I copied `/usr/share/software-center/ui/gtk3/css/softwarecenter.adwaita-dark.css` and renamed the copy to `softwarecenter.numix bluo-dark.css`, coz Numix Bluo (a custom mod of Numix theme) is my current GTK theme. Then I opened Software Center and it loaded the dark theme! 😊 But wait, the color was a bit grey coz of the old `stipple.png`. So, I tried @bsperger 's transparent stipple from https://bugs.launchpad.net/software-center/+bug/899878/comments/37 but for some reason it crashes Software Center. 😞 So, I tried the one from https://bugs.launchpad.net/software-center/+bug/899878/comments/40 and exported it to PNG using GIMP. Software Center loads it fine, but results were similar to the 4th case (transparent stipple with custom css) from https://bugs.launchpad.net/software-center/+bug/899878/comments/39 . So, like in the 5th case, I edited `/usr/share/software-center/softwarecenter/ui/gtk3/views/catview.py` and reduced alpha to 0.1 and then it looked well! So on the whole, the patch looks compatible with 14.04LTS's Software Center and so I request a backport through an SRU update. HEXCube, thanks for testing. The only thing I was slightly concerned about is the detection of the gnome dark theme in softwarecenter/ui/gtk3/utils.py. You can also use the original stipple and reduce the opacity to 0.3 or lower( to go darker). I dropped the transparent stipple as it was harder to get the right level of darkness without affecting the normal Ubuntu themes. In your case though, it's fine. Tested with Ubuntu Gnome 16.04 Live (daily build 2016.01.10) and seems to have this problem in default desktop theme&colors but not with "Global dark theme". Managed to get around to patching Trusty this evening. 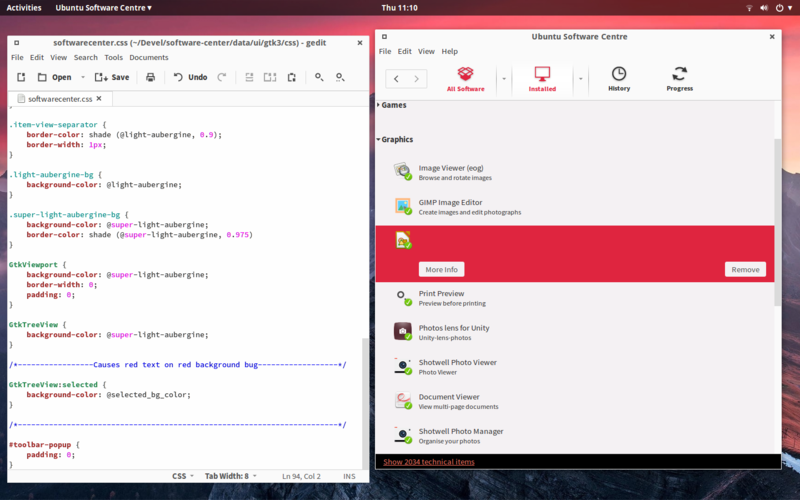 Tested on both Ubuntu GNOME and Ubuntu Unity with both dark and light themes. But modified the `utils.py` file a bit, so that it loads themes other than Adwaita in dark mode.😁 I've attached the modified `utils.py` file here. Don't mean to belittle your hard work or anything, but just wanna be sure your effort doesn't go waste. "Bug #899878 reported by Alexander Kabakow on 2011-12-04"
"Narcis Garcia wrote on 2014-07-15: Affects Ubuntu-Gnome 14.04"
> Does the SRU process continue even after the point releases? Yes. Updates still happen even if new install media isn't generated. That's part of what "supported" mean; updates are released to fix high priority bugs. hexcube, SRU policy is that fixes must land in newer Ubuntu releases first (Xenial and Yakkety). Please submit a new bug for the new issue. Bruce, do you want this uploaded now or should we wait for hexcube's addition? Let's get my patch in now so we can at least fix colors for default themes. I would look to test hexcube's changes with a few dark themes first. hexcube, Please also see my previous comment https://bugs.launchpad.net/ubuntu/+source/software-center/+bug/899878/comments/39 regarding other themes. @jbicha Thanks for explaining the SRU policy. So, SRUs are about backporting patches from newer Ubuntu releases without adding extra features, ryt? In that case, I think I should submit the feature patch for the current development release like u pointed out. @hexcube, Actually Software Center has been removed from zesty but software-center bugs still need to be fixed for yakkety and xenial before or at the same time as trusty. Thank you, Bruce. I uploaded your update. It will be need to be manually approved before it will be available in trusty-proposed. Accepted software-center into trusty-proposed. The package will build now and be available at https://launchpad.net/ubuntu/+source/software-center/13.10-0ubuntu4.2 in a few hours, and then in the -proposed repository. I confirm that software-center 13.10-0ubuntu4.2 works now with the Adwaita theme Dark variant on Ubuntu GNOME 14.04. The verification of the Stable Release Update for software-center has completed successfully and the package has now been released to -updates. Subsequently, the Ubuntu Stable Release Updates Team is being unsubscribed and will not receive messages about this bug report. In the event that you encounter a regression using the package from -updates please report a new bug using ubuntu-bug and tag the bug report regression-update so we can easily find any regressions. This fix seems to solve the problem. Ubuntu Software Center: Is the bg color of detail pages hard coded?